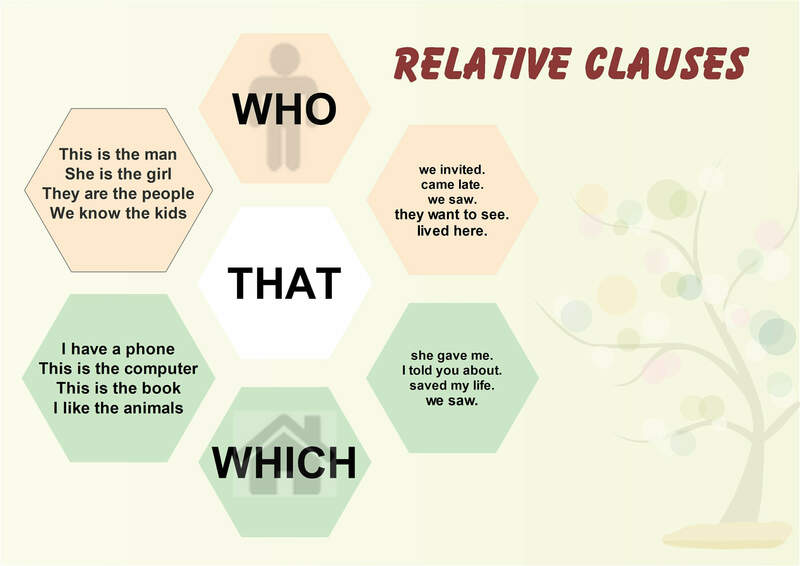 Relative clauses are one of the few grammar points I have covered just once. It might have been caused by the fact that I have always considered this grammar easy to understand and explain. Therefore, I never needed several infographics to help me. So it took several years before I created another infographic and a worksheet. I hope you will like them and find them useful. As I mention above, I have always considered relative clauses easy. Of course, there is the difference between the defining and non-defining clauses, but I solved this problem early on in my career and it worked. Now, I would like to share the solution with you. As you can see, relative clauses are used to give more details about someone or something. When we give more information about someone, we use the word WHO. When we give more information about something, we use the word WHICH. However, we can use the word THAT instead of WHO or WHICH and the meaning is the same. The problem is that you cannot use the word THAT in non-defining clauses. Non-defining clauses are the clauses which you can leave out. That was why I always stuck to WHICH and WHO and I never made a mistake. And I advise this to my students too. Download and print the following worksheet for your students. There are worksheets A and B in this activity. Hand out the worksheets. You need your students to work in pairs. One student has the worksheet A and the other has the worksheet B. Students work in pairs and they dictate their text to their partner. The partner listens and writes the sentences as he or she hears them. At the end they check their answers with their partner. Then, students work on their own and they try to solve the logical puzzle. The solution is down here. In the second exercise, students write the definitions. They can see the correct answers in the brackets. Then they work in pairs again. They read their definitions and their partner tries to guess the answer. They get one point for each correct answer. The winner is the student with most points. Good luck and I hope your students will know the grammar very well.